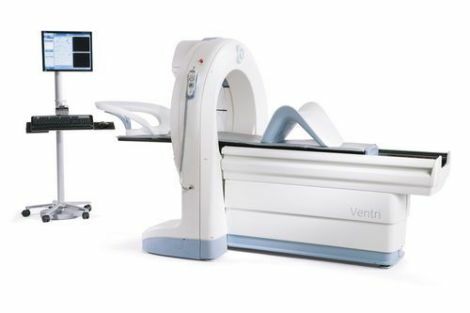 The GE Ventri is a compact, ergonomic-designed, cardiac-optimized nuclear imaging system. It is comprised of two small field-of-veiw detectors that are in a 90° geometry mounted on a ring gantry, a compact 2-axis imaging table and a dedicated acquisition station. Ventri features a wide variety of cardiac imaging procedures including static, dynamic, multi-gated and gated SPECT nuclear imaging scans. Memorized Scan Parameters – The acquisition station records all scan parameters from the first scan. When patient returns for the second scan, setup is as easy as pressing “learn from rest” or “learn from stress.” The camera will automatically position the patient for the second scan at the same position as the first scan.